If you are searching for the Genuine CCC Study Material, you are at the right destination. 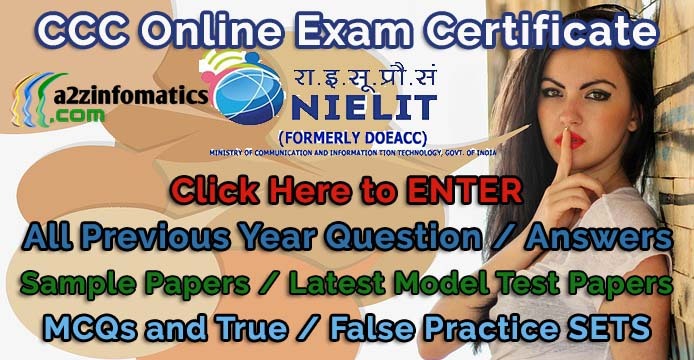 Today, we are here with another DOEACC / NIELIT CCC Question Answer / Solved Previous Year MCQ Practice Paper SET-H with the Solution / Answer Keys. 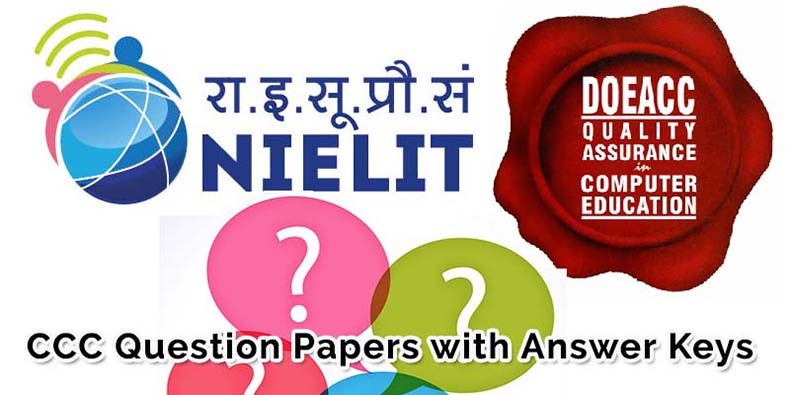 Believe or not, these CCC Question Paper SETS with the Answer Keys will provide you the required knowledge and energy to crack the upcoming DOEACC / NIELIT CCC Examination at the first attempt. These CCC Question Papers are as per the latest 2018 CCC Exam Syllabus. Best of Luck for the CCC Examination, please do check all other previous year CCC Question Papers published earlier at our website. CCC Question Answer / Previous Year Solved Question Paper Set-H. Note: This CCC Previous Year Question Answer Paper (SET-H) consist of total 50 question with the answers at page no 4 of this post. Ques 4- What type of device is computer keyboard ? (c) Much costlier than a single transistor. (d) Fabricated on a tiny silicon chip. Ques 7- Which of the following is not a pair tag ? (a) web page editing software. (c) just a notepad can be used. Ques 9- By default, on which page the header or the footer is printed ? Ques 10- Where can you find the horizontal split bar on MS Word screen ? (a) On the left of horizontal scroll bar. (b) On the right of horizontal scroll bar. (c) On the top of vertical scroll bar. (d) At the bottom of vertical scroll bar. (a) open paragraph dialog box activating go to tab. (b) open page set-up dialog box activating go to tab. (c) open find and replace dialog box with activating go to tab. (d) open go to dialog box. Ques 14- Which scheduling algorithm allocates the CPU first to the process that requests the CPU first ? (a) First come, First-served scheduling. (a) is same as any other regular file. (b) must be accessed at specific rate. (c) stored on remote server can not be delivered to its client. (a) Double clicking on the column name on column header. (b) Double click on the cell pointer in worksheet. (c) Double clicking on column right border on column header. (d) Double clicking on the column left border of column header. Ques 20- How can you remove border applied in cells ? (a) Choose none on border tab of format cells. (b) Open the list on border tool in formatting toolbar then choose first tool (no border). You are now on the Page No 1 of this CCC Question Answer / CCC Solved Previous Year MCQ Practice Paper SET-H. Complete Answer Keys for CCC Previous Year Question Paper Set-H on Page no 4 of this Post.